Over the course of treatment, you will be supplied with a series of aligners. Each aligner will make slight adjustments to tooth position, a process that is mapped out in advance by Dr. Henry Jr. or Dr. Mary Paula, specifically for your situation. When the aligners are placed on the teeth, they cause the teeth to gradually shift from their current position. 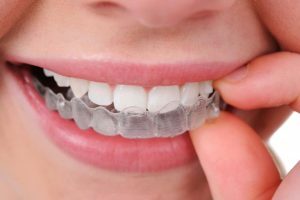 After approximately two weeks, you will begin using the next set of aligners, which will continue the teeth straightening process. Though the length of your treatment depends on your case and your treatment goals, the average amount of time for an adult takes about 12-18 months. Zaytoun Orthodontics recommends that you wear your aligners from 20 to 22 hours a day, so you’ll see significant improvements along the way!